The Ernie Ball Expression Tremolo delivers foot-sweepable tremolo control, all without taking your hands off the guitar. Choose from 5 distinct waveforms (slow rise, slow fall, sine, square, and harmonic) plus onboard vintage inspired spring reverb to create subtle or dramatic pulsating soundscapes. Control depth, rate, or both parameters simultaneously with the foot treadle. The Expression Tremolo’s sleek, compact design maximizes playability, while minimizing the footprint on your pedal board. Unlock a virtually limitless tonal palette that simply can’t be matched by traditional “on/off” stompboxes. The Ernie Ball Volume Pedal is probably the only truly iconic volume pedal in the gear world, represented on the pedalboards of touring superstars and garage bands alike. 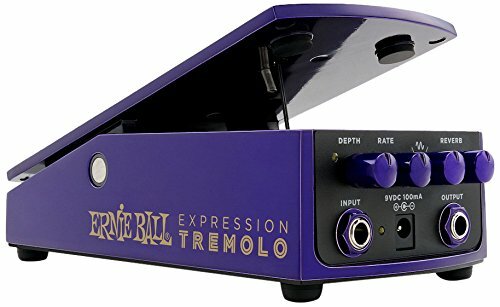 With its new series of expression-based effects pedals, Ernie Ball has been seeking to capitalise on their brand recognition and reputation to move closer to the booming compact effects market. This Tremolo is a welcome addition to the range, with controls for depth, rate, wave shape and a decent reverb. The rate functions as a maximum for the treadle – with toe down it is fastest, toe up, bypassed. Although the additional reverb doesn’t add a huge amount, the different wave shapes are a joy, and the reverse-triangle setting is very Baba O’Riley over fingerpicked arpeggios high up the fretboard. Traditional trem sounds are available, and the effect of the more subtle trem sounds is in the ballpark of a vintage Fender. The hidden gem is the harmonic mode. Once discovered, the pedal didn’t see much action elsewhere, with subtle phasing sounds being mixed into picked patterns, and Jimi Hendrix histrionics into a distorted Marshall chewing up most of an afternoon. The only snagging issue is that the pedal still operates via the same loop and string system as the original volume pedal. Occasionally flaky and prone to needing replacing halfway through a tour, it might more appropriately be replaced with a modern optical system. It’s the only weak point of the build, though, as the pedal itself is rock-solid and the treadle travel is butter-smooth – and those sounds are certainly well worth experiencing.